I love the holidays. I love watching the seasons change and bundling up because of the cold weather. I love listening to Christmas music (which in our house starts November 1), decorating, and spend extra time with family and friends. But the holidays can be really stressful, too. There are presents to buy, crowds and traffic to deal with, schedules to juggle, and a lot more activity and tasks to do at work and around the house. The holidays can also be a painful reminder of our past hurts, broken relationships, and unfulfilled dreams. Many people dread this season more than any other time of the year. 1. Don’t accept every invitation. It’s easy to add a lot of extra activities to our already fast-paced lives during the holidays. To get the most out of this time of year we need to be willing to say no to a lot of good opportunities so we can say yes to the ones that are most important to us. Trying to do everything will keep you from enjoying anything. Decide which activities you’re family really wants to go to and politely decline everything else. 2. Create a spending budget. Determine how much you can reasonably afford to spend on the holidays (gifts, meals out, etc) and set that aside as soon as possible. Joshua Becker over at Becoming Minimalist does a great job explaining how to create A Personal Spending Plan That Works, which will help you create a budget for times of the year like this when you spend more money than usual. His plan will help you keep from over-spending, while at the same time allowing you to enjoy what you have. It’s unrealistic to think you can buy something for everyone in your life. Most of us don’t have the budget (or time) for that. Even within the context of our families that can be difficult. One of the things that our family does to alleviate that burden is to draw names out of a hat to decide who we’re going to buy gifts for. This saves us a lot of time and money. 3. Buy less possessions and more experiences. Our holiday spending shouldn’t be limited to just purchasing gifts. Use your money to also buy experiences with the people you love. Spending your money to rent a cabin for your family, go skiing, go out to a nice meal, see a movie, or build a snowman are all ways to buy less possessions and more experiences. You and your family will love it, and the memories of those times together will last a lot longer than anything you can buy to put under the tree. 4. Be intentional about the things you decide to purchase. There’s nothing wrong with giving the occasional gift card here and there, but don’t limit yourself to simply giving gift cards. Give some thought to the wants, hopes, and dreams of the person you’re buying a gift for (especially if there love language is gifts). What would be the most meaningful thing you can get them with the resources that you have? One of the things my wife and I do for our kids at Christmas is to buy them something to wear, something to read, something they need, something they want, and something that points them to God. You don’t need to be this detailed for everyone on your gift list, but take some time to consider what the most meaningful expression of your love to this person could be. 5. Create some fun traditions. Growing up we had lots of fun traditions in my family. After leaving a glass of milk and a plate of cookies out for Santa we would drive to my dad’s side of the family for a traditional ham dinner on Christmas Eve. After eating and hanging out for a bit we would read the Christmas story and open gifts. Then, we would drive to my mom’s side of the family where we would have tamales, enchiladas, and rice and stay up till midnight playing games. After driving home we would sleep in and open all the gifts at our house, just the three of us, and spend the rest of the day in our pajamas. These traditions weren’t very elaborate but they always have a special place in my heart. Whether you continue the traditions you grew up with or start your own, make sure they are meaningful and enjoyable to you and your family. 6. Do something for those in need. One of the top things really happy do is helping others. Sometimes that takes the form of making a donation; other times it’s in the form of donating your time to help out your church, local hospital or homeless shelter. During this season it’s easy to get so caught up in all the gifts and consumerism that we lose sight of the people, both near and far, who are struggling in their everyday life. It’s never been easier to give back to those in need and you’ll feel happier for having done it. It may be just the thing you need to get of the holiday funk. Side Note: During the month of November I am working with The Hope Effect to provide homes for orphans. If you’re interested in a great and easy way to do make a difference in someone’s life this may be just what you’re looking for. Click here to learn more. Author and speaker Doug Fields says, “Your kids need your presence more than they need your presents.” He is spot on. Don’t let the pace of this season keep you from spending and enjoying time with the ones you love. Turn off your phone and the TV and sit with each other, talk, listen, play games, and build memories together. The holidays can be a stressful time, but they can also be an incredible time. Some of my favorite times in life have happened during the holidays. As hard as they can be they can also be great if we work at it. 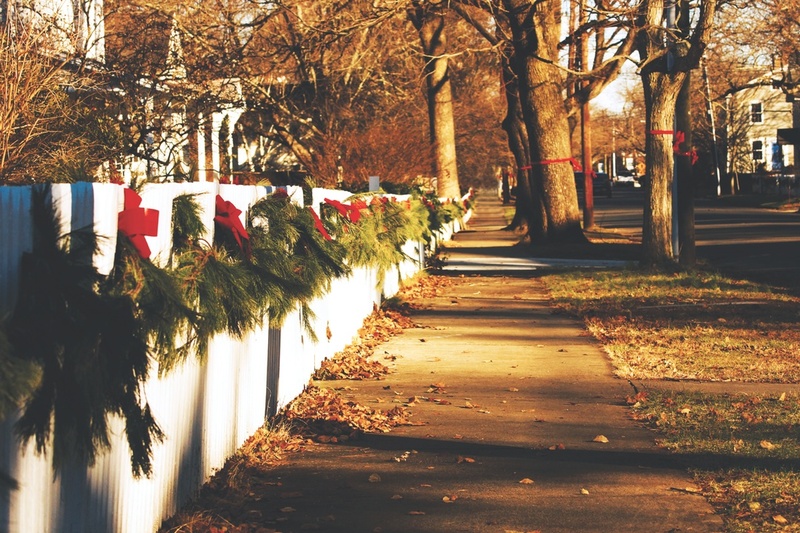 Start planning how you’ll use these tips to enjoy the holidays more this year. You’ll be glad you did.